Trade Reading Order » The Marvel List Is Going Up! The Marvel List Is Going Up! Alllllright! 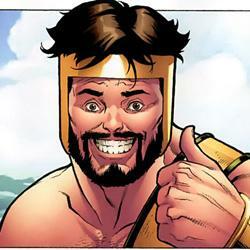 Now’s a good time to reuse this Herc image. The marvel database is ready to upload. It’s not super simple (as it requires making about 3000 new database entries and about doubling the size of this entire website.) Plus there are going to need to be some structural redesigns and redone code for you to actually have access to all that information. Please bear with us while these changes move through. At the earliest, I hope to get it up and mostly accessible by tomorrow afternoon. At the worst, it might take a couple days if we run into some problems. 1. Expect the existing marvel books to disappear first. 2. A few of the DC categories are also going to go, or change, which means you might have to update some of your links. A. For example, there will no longer be the “recommended reading order” – that’s basically just going to be the DCU list. Same for the other two lists… we’ll be implementing sorting in another way soon. B. the ages will be changed to say “DC Golden Age” etc. And “Marvel Golden Age” would be the equivalent. 3. A million books will be going up so the site might be a little slow. 4. The front page will be shifted around a bit, with the marvel character tag list finally showing up, etc. 5. Same for the sidebar, the real-estate will be split. Soon I will have dedicated pages to view ALL the character, series, etc, tags in a list form (instead of just the drop downs) but we’ll concentrate on the more important stuff first. That’s basically it. There are a few more things, but the first goal is just to get all the information online. We’ll worry about making the site a little more user friendly again after that main step. Feel free to keep an eye on the Marvel Progress forum thread for specific updates. But I’ll post another blog post when everything is up, of course! Also, I figure I misewell use this post to announce the Green Arrow: Road To Jericho Giveaway Winner! It’s Tim from California, MD (TRO User timjoyce2828). Congrats, Tim! For everyone else, make sure you enter the current giveaway. That is, if you like free stuff! Update 1: The books are up! They were uploaded in 12 batches, with the site going slow for a little, but it seems to mostly have recovered. Feel free to browse around and start adding stuff to your collection. I’ll be working to get all the info on the sidebar, get some header images in, etc. I’ll keep you up to date! Update 2: Marvel info is now showing on the front page! As we expected, the X-Men Family is pretty solidly at number 1. I’d like to get the counts working again, I’ll see if I can. Update 3: Marvel info on the sidebar is in! Expect the Marvel Quick List to go up tomorrow and to see the categories added to the top navigation. I’ll keep tweaking the sidebars as well. And keep up the advisory comments, that’s the best! (and also tomorrow, maybe first thing, I’m gonna treat my self to putting in my collection and sorting my bookshelf!) Now I’m going to sleep! It’s been 11 hours straight sitting here this session! Update 4: All the stuff talked about in this post is complete! I’m going to try to create some character/tag archives, but besides that, consider it live! Looking forward to utilizing the hell out of it. Thanks for your hard work Ian. The ‘Recommended Reading Order’ is what I use most – so as long as that remains the default order, I’m happy. yeah, the order is actually the same on the two lists right now even. The sorting differences (by date, alphabetical) are going to be implemented via a drop down instead of a whole different category.